IT MIGHT not have felt much like spring recently, but sitting in the Bigton Hall last night with the sun streaming in through the windows and that unmistakable folk festival buzz in the air, you could be forgiven for thinking it was a hazy summer evening. Local band Hollow Mountain added to the summery vibe, kicking things off with their cheerful set and a song which paid tribute to a day at the eela. 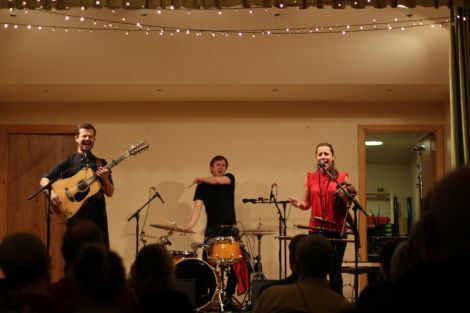 The band, which consists of frontwoman and songwriter Marie Williamson along with Alan Mackay on guitar, Nathan Leask on electric bass, percussionist Lubor Zemanek and Radi Mackay and Gillian Wiliamson on vocals, has an almost global sound, which figures when you take into account that the band members originate from Bulgaria, Australia, Glasgow and Shetland. With soaring harmonies and interesting melodies on songs like Home, the band has a lovely confident sound, the electric bass lending a funky almost jazzy element. The first visiting act of the night, Trio Dhoore, are a Belgian three-piece consisting of brothers Ward (acoustic guitar), Hartwin (accordion) and Koen (hurdy gurdy). Their mix of traditional Flemish and self-penned, modern folk tunes has a gentle feel, with solid guitar playing backing the fluid melodies of the accordion and hurdy gurdy (an instrument I’d never heard before but was captivated by). The brothers’ easy and relaxed nature was evident, and tunes like the one written for the young daughter of a friend who just couldn’t stop dancing to bagpipe music sum up the joyful, modest feel of the band. After the break the second local act of the night, Elan, took to the stage. Featuring accordionist Lana Elaine Fraser accompanied by the sensitive guitar playing of Gary Smith, their set featured jigs and reels from the likes of John Rankin and Sandy Brechin as well as Lana’s own arrangements. Compere Lisa Johnson welcomed the next act to the stage by informing the audience they were in for something “completely different”, and she wasn’t wrong. Estonian band Trad Attack! had the crowd stamping their feet almost instantly with their distinctly Eastern European turbo-folk feel. They have the makings of one of those unforgettable folk festival acts, their infectious, high-energy music including staccato singing, rock drums, Jews harp twangs, a 12-string acoustic guitar that sounds closer to an electric one and archive recordings of traditional Estonian folk songs from the 1960s. It really shouldn’t work, but it does, and very well. Husband and wife Jalmar (guitar and vocals) and Sandra (vocals, Jews harp, Estonian bagpipes) Vabarna are joined by drummer Tõnu Tubli, and together they push the boundaries of what folk music is, in the best way possible. American quintet The Lonely Heartstring Band had an altogether more gentle sound to close the evening, with their blend of bluegrass, old timey and newer Americana music. Their tight musicianship has a slick feel to it. 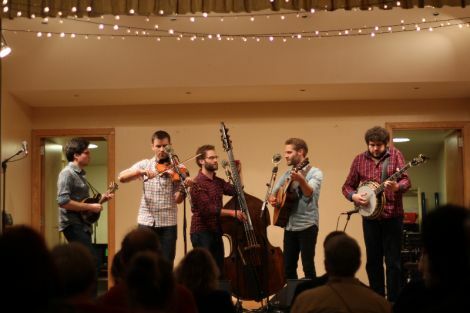 The vocals of twin brothers George and Charles Clements and Patrick M’Gonigle, also on fiddle, soared, and along with stellar mandolin and banjo playing from Matt Witler and Gabe Hirshfield the band is a smooth operation. With Wittler’s random Los Angeles sheep facts and a murder story from the brilliantly droll Hirshfield, there was humour aplenty. The band also handled the unwelcome inclusion to their music of a bus reverse warning alert – which was picked up through an open window and amplified unbelievably loudly through the speakers – extremely well, opting for a louder song to drown out the beeping vehicle. Concerts like Bigton are what the folk festival is all about: good music, yes, but stories and laughter too. 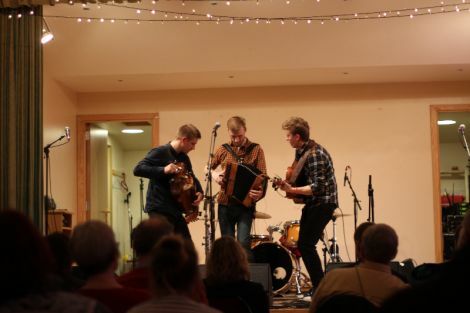 If these acts are anything to go by, the 37th Shetland Folk Festival is sure to be another beezer.